Biker Charities | Hupy and Abraham, S.C. 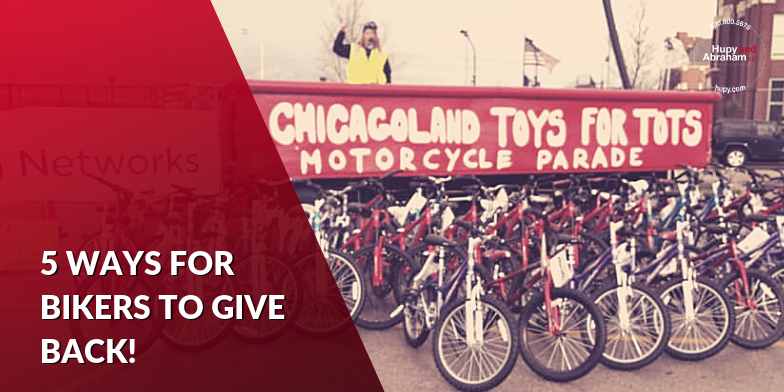 Bikers are known for being notoriously charitable. The fierce appearance or iron, chrome, and leather more often than not hide an interior that’s deeply concerned and connected to those less fortunate in the community. This year if you’re a biker (and even if you’re not! ), consider joining the cause of some of these fantastic biker-run charity events. Below are our top picks, but tell us in the comments if we missed any! Rolling Thunder Ride for Freedom: Every year, hundreds of thousands of bikers ride through the Capitol in a rally that’s often called “Run for the Wall.” These united motorcyclists ride to raise awareness of POWs still being held or listed missing in action. The ride begins at the Pentagon and travels through Washington, finally ending at the Vietnam Veterans Memorial. Poker Runs: One of the most popular biker fundraising efforts is the poker run, which combines the namesake card game with a motorcycle ride. The proceeds collected throughout the run are then donated to a charity, cause, or civic organization. You can find dozens of poker runs occurring at any given time during riding season, or you can get your friends together and start your own for a cause you hold dear! 3J’s Sonoma Raceway Motorcycle Days: This unique biker charity event is for the speed freaks! Held at the Sonoma Raceway in Sonoma, California, this charity track day raises money for Sonoma County youth groups. Since 2003, 3J’s Motorcycle Days has raised almost $460,000 for charitable causes. Hupy and Abraham has supported motorcyclists for over 40 years. During that time, we’ve spent hundreds of thousands of dollars on the “Watch for Motorcycles” awareness campaign in an effort to protect riders. To get YOUR free “Watch for Motorcycles” sticker in a variety of colors and sizes, click here! And be sure to visit our online motorcycle event calendar regularly to get the inside scoop on great events throughout Wisconsin, Illinois, and Iowa.